Check out our geeky Christmas song video for 2014 – and Merry Christmas! 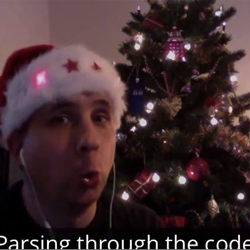 As you may or may not know, we have a tradition where each year, we sing a silly Christmas song about a geeky topic. Special thanks to Ellen Shapiro for the guitar music and background singing, and Chris Belanger for the piano music! 2010 Christmas Song: Titled “The 12 Days of iPhone Dev”.